For readers of audio books, especially folks reading technical or reference material prior to the age of computer indexing, you often wanted to scan through material quickly to find the passage you needed. Talking book machines for blind and visually impaired readers started to include such features almost from the very beginning. But the first such controls were simple, speeding up the phonograph. Most kids of my era know how entertaining it could be to play a 33 rpm record at 45. It speeded it up, yes, but the singer sounded like one of Santa’s elves. Sound guys called that “chipmunk distortion.” Later machines that appeared in the 1970s included a component that adjusted the pitch as you increased the speed, and kept the speaker’s voice sounding relatively normal. 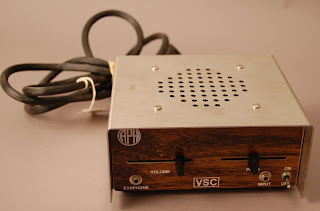 But if you couldn’t afford to buy a new player, you could get our Object of the Week, the APH Variable Speech Control Module. It was basically a phonograph accessory allowing recorded speech to be increased or decreased without pitch distortion. It was introduced in the APH catalog in 1976. A digital version came out in 1999. 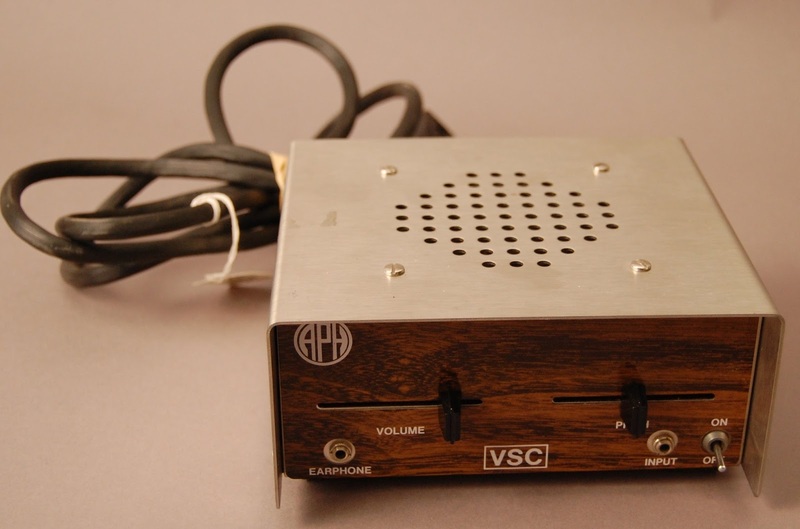 It used proprietary technology developed by the VSC Corporation, which took the “chipmunk” out of speed listening. It is a rectangular aluminum box about 6 inches square with a patch of wood grain on the front. I’m not sure why everything in the 1970s had to have fake wood grain, but there you are. On the front are sliding switches to adjust the pitch and volume and jacks for a headphone and to bring in the signal from the phonograph or cassette player.